For that special day your kids will love one of our Billy Bonkers Birthday Bonanzas packages. The options are:- Bush Babies for 7 years & under, Bumble Bees for 8 to 12 year old, Bushcraft Bonanzas for 8+ years or Bonkers Baboons for 13 + years. Each package offers an exciting package of activities at CONKERS - suitable for the age group and a delicious hot and cold buffet, party bags, table decorations plus a present for the birthday child! We also offer an adults only buffet (extra charge applies) please ask for further details. Includes exclusive hire of our thrilling party room for two whole hours, where you can enjoy the site, and retreat back for a party meal! Hot or cold buffet plus soft drinks included. Adults free (access to party room only). Includes exclusive hire of our thrilling party room for two whole hours, where you can enjoy yourselves to your heart’s content in the crazy indoor Billy Bonkers Playhouse! An enthralling ranger led activity led across the site and through the growing woodland to construct the coolest collages from materials found along your route, plus all children will gain entry into the entire 120 acre CONKERS site. Hot or cold buffet plus soft drinks included. Two adults free. Additional adults just £5.00. For every 5 children there must be one adult to supervise. Let loose the artist within you and creatively design your own amazing take-home-party-favour. choose your favourite shaped pot, whether it be car, snail or fairy! Go wild with the detail you wish to see and our team will even glaze & wrap it for you to take home! What lies beneath the surface of the water? Discover the secrets of these creatures; how they breathe, what they feed on and how they survive! Children are taught how to pond dip and how to use basic keys in order to identify the creatures they find. Unlock your inner Ray Mears and learn how to survive in the woodland. First, learn how to make a shelter using basic equipment. Then learn how to make a fire using flint and steel. The fun doesn’t stop there! Marshmallows and chocolate biscuits are available for you to makes s’mores over a fire. Toasties plus soft drinks included. Two adults free. Additional adults just £5.00. 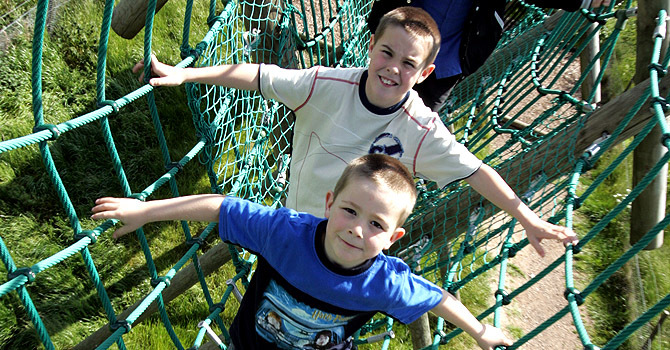 Dare to challenge each other on our exhilarating eighteen piece assault course challenge – brave the climbing tower, fearlessly walk the rope bridge and fly down the zip wire. Plus you get free entrance to the entire 120 acre site. 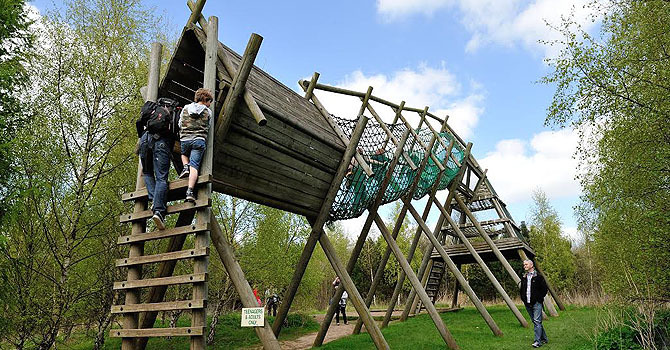 The Conkers High Ropes party experience includes an hour of adrenaline pumping fun (2 Ropes Activities) followed by a delicious hot or cold buffet lunch, party bags and a present for the birthday child! Each party starts with the activity followed by the buffet lunch. Ropes Party bookings are delivered between 10am-12noon. The price per child is £18.00. Is your child super active? Are their friends super active too? Want a party to keep them busy and really wear'em'out without having to chase them all around the site yourself? Then let them conquer their fears on the ropes adrenaline package, which includes the High Ropes, Zip Wire, Power Descender & Climbing Wall! Our ropes instructors lead budding climbers with group coordination and safety expertise. All this followed by Bush Craft Bonanza, with Ranger Led fire lighting, wood sourcing and cooking your own toasties and s'mores for lunch! This is an activity party that party parents love to host! Minimum of 10 children per party booking. We require one adult per five children per party. There must be adult supervision on the day of the party. CONKERS staff lead parties but are not responsible for supervising the party at all times. Non-refundable deposit of £50 must be paid on booking Balance can be paid before or on the day, but a minimum of 10 children must be paid for. Disclaimer form will then be issued for the assault course challenge. Please see conditions for High and Low Packages.